Recently I have bought a book called “The Fundamentals of Graphic Design” by Gavin Ambrose & Paul Harris (AVA Academia). Finding the design of the book interesting I used it as an inspiration for this wordpress theme. 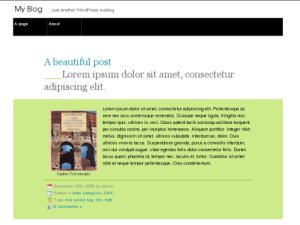 customizable colors and blog position. I just wanted to express my gratitude for such a beautiful and functional theme. I really haven’t seen anything else so lovely out there, at least for what I was looking for for my client. Great work! Hi nice post, i have come across your site once before when searching for something so i was just wondering something. I love your theme, would it happen to be a free one i can download, or is it a custom one you had made? In a few months i may get my own domain, but i don’t know how to setup themes so i don’t mind paying someone to make me a nice one and set it all up. Do you know any good WordPress designer companies, thanks for your help. The theme of arjuna.deltoso.net is just a quick theme I’ve made for personal use (it is really far from being a stable, production-ready product). If you need just a theme with lite customizations you can find a lot of good themes at http://wordpress.org/extend/themes/ . Hey I am using a heavily modified version of your theme and it’s great! However I cannot for the life of me get it to center. Do you have any advice as to how I could do that? Nevermind I’m stupid. I was trying to do it via CSS and didn’t even realize that it’s selectable in the WP dashboard. awesome theme; I love it! Thanks for releasing this as a free theme. One question: I would like to enable comments on pages. Can this be done? I am happy to alter php pages, but can’t figure out the piece of code I need to add to page.php (or where to do it). Thanks again for such a fantastically beautiful theme!